Last night we celebrated my Dad’s 60th birthday! My dad is a giant among men whom I think is perfect in every way. Growing up he never raised his voice in our home – not once! He exudes patience, humility and kindness. This isn’t to say he isn’t strong, determined and courageous. He has raised three children with the chronic disease, cystic fibrosis (including myself and losing my brother to the disease) and has always been a pillar of strength and determination, leading the battle charge to cure CF (he serves on the national CF board). He also has taught me to live life with an eternal perspective, with loving family and serving others as our very top priority. No matter how crazy his work was growing up (he runs a publicly traded company which adds the additional stress of performing well for shareholders), he was always right by my side at every hospitalization. 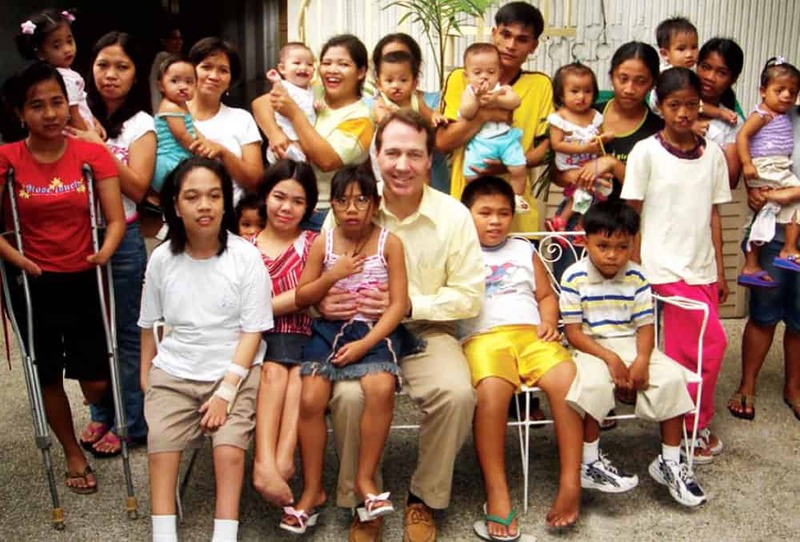 The second he was the least bit successful, he began his own nonprofit charity, The Sabin Children’s Foundation, which serves thousands of underprivileged children worldwide. For my dad’s 60th birthday, my siblings, nieces and nephews compiled a book of 60 memories or qualities we admire about him. Each of the siblings contributed 10 items. Out of a lifetime of memories and from a bottomless treasure trove of qualities to choose from, each sibling (4 total), all said one thing in common. We all remember coming home late on Friday nights from a long afternoon of piano lessons to my dad’s homemade goulash. What is goulash? you might ask. We could never quite be sure. It would be a soup/stew/chili with a tomato or cream of chicken soup base with any freezer vegetables, meat or canned goods my dad thought “worked.” We were always excited to see what dad’s goulash would be, even if we weren’t excited to eat it. As I reflect back on dad’s goulash, it was one of his sweet ways of loving my mom (who no doubt had a long day with 5 children complaining about piano) by preparing dinner the only way he knew how. Like I said, the man is a saint. 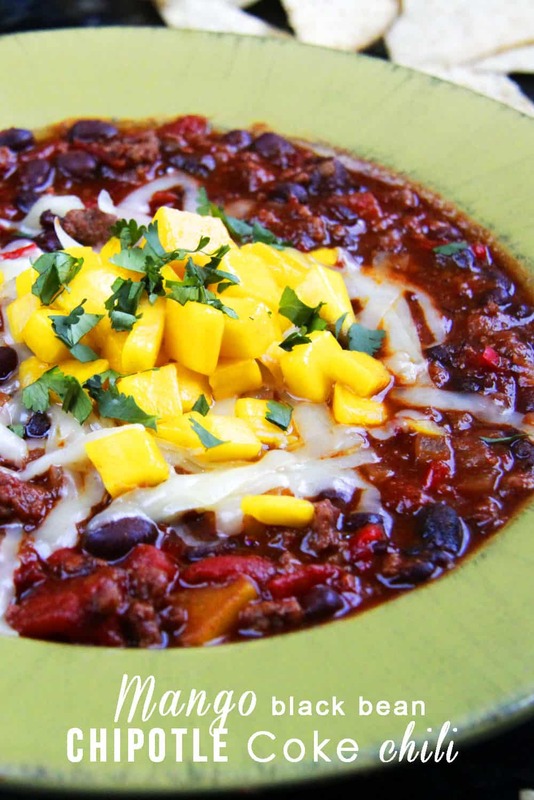 So like my dad’s goulash, this Mango Black Bean Chipotle Coke Chili is created with love. Unlike my dad’s goulash, you can be sure you are getting the most delicious bowl of chili every time. And I mean seriously delicious! So delicious, in fact, that I am going to go ahead and presumptuously assume this will be your new favorite chili. 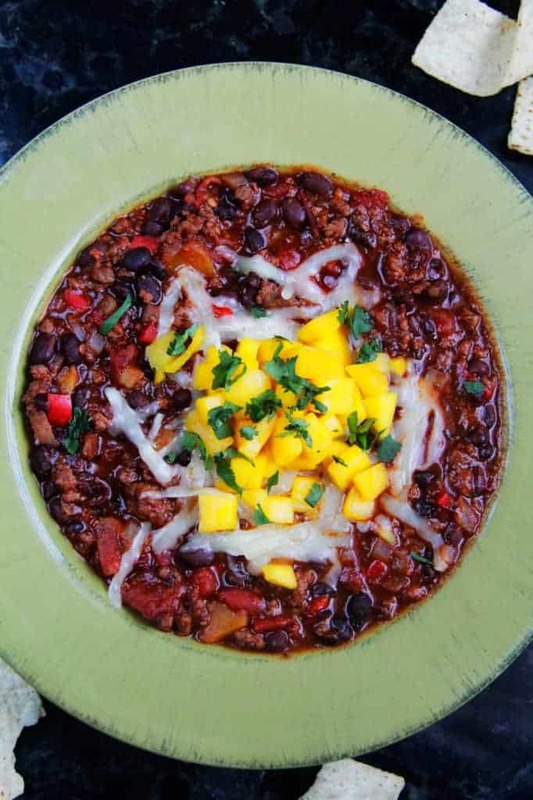 Because it is my new favorite chili and one of my favorite recipes I have ever created. It is so delicious, I want to make it all the time. And because all the time might be a bit obsessive, I have already made it into enchiladas and have big plans to make fajitas, tacos, chimichangas, etc. I have plans. Big plans. 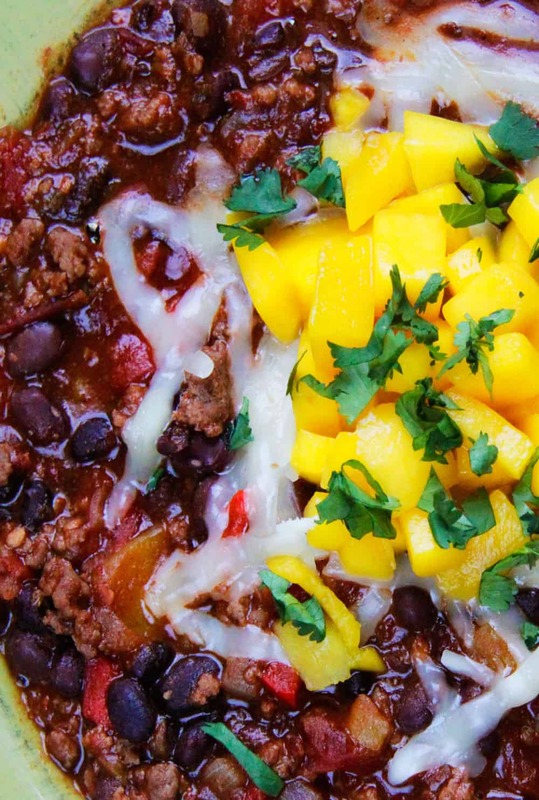 All self serving plans so I can eat this Mango Black Bean Chipotle Coke Chili all the time – in one form or another. I almost don’t even want to begin to describe how good this is because my words simply can’t do it justice. Let me just say the sweetness of the coke and mangos is perfectly balanced by the smoked paprika and chipotle chili peppers, creating a smoky, sweet chipotle bath that envelops the black beans, tomatoes, mangos and meat, all topped with sweet, fresh mangos, Monterey Jack cheese and cilantro so each bite is smoky, cheesy, and a little spicy – everything a chili should be – and more….so much more! So, like you have heard from me before, I really hope you make this! And when I say make, I really mean brown some meat, throw in some spices, dump in some cans and chop some mangos and chipotle peppers and let the chili simmer on cruise control (seriously, just look at the directions!). It is the perfect company, plan ahead, or busy night meal. Its the perfect meal all the time. Perfect because its created with the love of my father’s goulash. Heat 1 tablespoon olive oil over medium-high heat. Add beef and onions and cook until beef is cooked through. Add bell pepper, garlic and spices and saute for two minutes. Add brown sugar, tomatoes, beans, mangoes, ¾ of the coke can and chipotle peppers; adding chipotle peppers 1 at a time until you reach desired heat. Reduce heat to low, cover and simmer for 20-30 minutes, until chili has thickened to desired consistency and flavors have melded. Stir occasionally. If you prefer your chili less thick you can add the remaining coke after simmering. 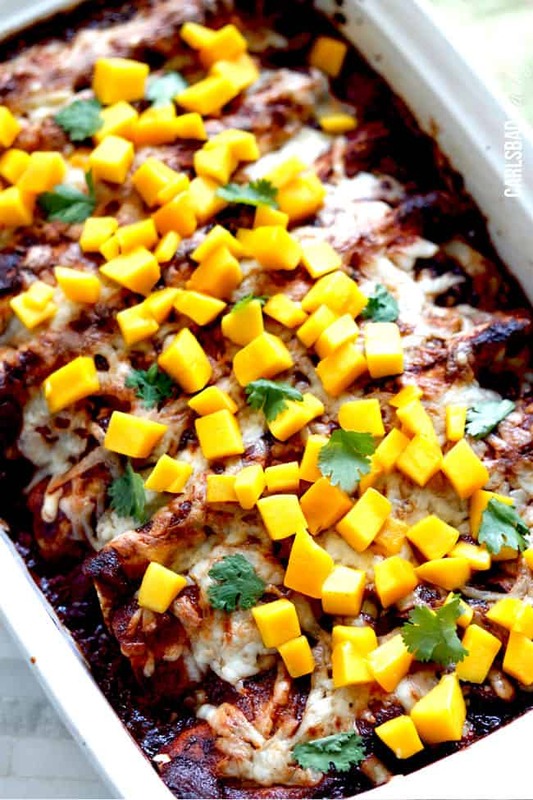 Top with shredded cheese, chopped mangoes, crushed tortilla chips and chopped cilantro. 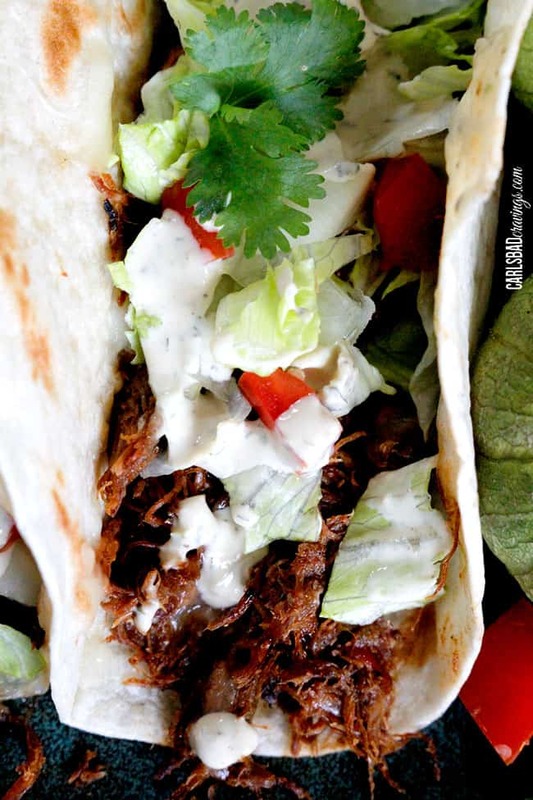 OMG making this right now. My sister found yoour recipe and we have been making it for a year now. I also add 1/2t cinammon and 1 sq of dark chocolate. Yummy. We also have substitued beer for the coke and it was just as good but would like to try something a bit healthier than the coke (so much sugar). Any ideas? OBTW I also mix ground turkey and ground beef. Hi Karen, I am so glad you love this recipe so much! and the addition of cinnamon and dark chocolate sound divine! Finally, replying on the multitude of your amazing, tantalizing,delectible,and any other adjectives that may result in a severe salivating(involuntary),response. Discovered food blogs back in March, while recovering from my millionth,(major ,of course), surgery.Before,years of bad health crazy was, I was a biblical cooking and baking home monster. Now am wayyy beyond a monster. Thanks, in part to your recipes. Having tried,so far about 10 of your delights, hubs is complaining that his 56year old muffintop is growing! WHOO! Girlfriend to die for! As well as you and hubs are adorable!Your story, inspiring! Love you cutie, and thanks,fellow tiny girl, (54,adhd,missing organs too, love the beach but live in AZ. 100lbs.on a good day, will you be my friend?) blessings your way! The best chili ever. Period. You made my day Magda, thank you so much! I am so happy you loved it!! Hi Jen! 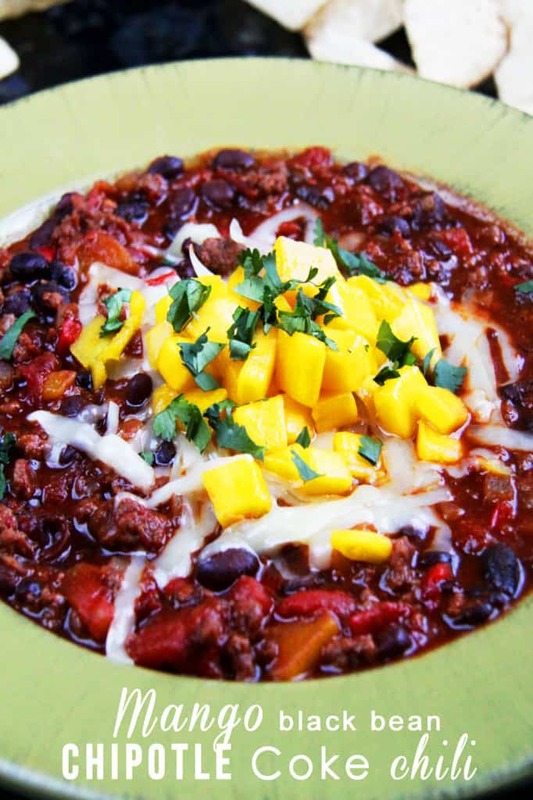 Do you put mangoes in the chili or are they just a garnish? I was a little confused making it, so I’m just using them as a garnish, I may have just missed something! I want to make this, and love your blog. However, your dad sounds like my dear husband, who has been dad to 35 foster children, adopted six kids, three of which have very special needs, including mental illness. We have a very successful nursery, that my DH runs, and is absolutely fabulous what he knows, and how he treats his employees. Like your dad, my Jim comes home and will do dishes, cook, do laundry — love language is service. You are probably like me — the Mom — my love language is gifts, which includes great scratch food. You obviously have the same love language, and thank you for imparting your gift to all of us who who cruise the Pinterest looking for cool recipes to feed our loved ones in our family.